How wide is the Tappan? Katy - Thanks to your brackets & knob, mine is getting closer to making it's way to the kitchen..
Northland - I've missed your blog. Congrats on the new house! Wow, what a view that house has. Looks like it has some great woodwork too. I'll get you back on my blog roll. Awesome! Thanks for adding Tappan Talk to your great blog. I'm getting ready to tear mine apart, finally, probably right after the New Year. Cruising through eBay and saw this Tappan. I'm pretty sure it was re-done, based on how shiny the burner grates are, and also the chroming of the front panels and top panel. Thought I would post here so anyone who is restoring can see what theirs would look like if they didn't keep it all porcelain. Tappan Trailer - I'll be interested to hear how your restoration goes. My advice, take a ton of photos. It's surprising how fast you forget what goes where. Those griddles aren't all that rare. I've seen one other one go up on ebay after I bought mine. I'll post more over on Tappan Talk soon, but I actually think they go with a 1940's early version Tappan. I think the Deluxe griddle fits over only one burner...but this is just conjecture based on illustrations I've seen. I also saw that tricked out Deluxe over on ebay. I haven't seen another one like it....like you said either a restored or maybe a showroom model. Very cool. First as I wrote earlier THANK YOU fo this blog! I'm wild about the Tappan 60 series Doughboy & have found inspiration here. 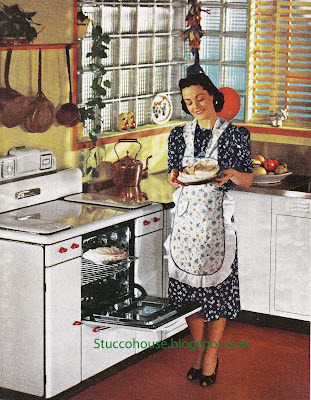 By 1950 Tappan had (2) stoves avaialble of which the 60 series Doughboy is one. Within the 60 series there were (4) models: the 65,665,67 and 667. The version with the light-up bezzels was called the 66 & 67 series in Fall 1949. By Spring 1950 this same stove was refered to as the 669 series. I believe the broiler toe-kick was introduced in 1952 & helps date these. The "tricked-out" version with chrome detailing I think was called the Super 60 and must have be very rare. To me the Tappan Doughboys were to stoves what the 55-57 Chevies were to cars. Thanks again for your new intro! In Fall 1949 these were refered to as the 67 & 667 series; by Spring 1950 they were referenced as the 669 series. Joe - Give me a bit & I can add a few details to your info on the models of Series 60. I plan a post on that over on my Tappan Talk page. Thank you SO much for all of this information on these stoves!! I am moving into a new rental this week, and low and behold my "new" cook stove is a vintage Tappan deluxe.... i have started cleaning her up, some people have not been nice to her... and started trying to figure out how to use her properly... your posts have helped me realize i don't have to use a match every time i light a burner... and have showed me where to light the oven pilot and well.. honestly.. where the oven controls were... i had been comfused til i found your blog! thank you! Zetta - I'm happy the info. has helped! Once you move in, I'd love to post pictures of your "new" Tappan on the blog for other to see. And I hope you join in on the conversation over there....the more, the merrier!